We’ve enjoyed a fantastic summer season, thank you to everyone who contributed and helped us to make it such a success. Now that autumn is just around the corner we have published our 2018-19 Arena Fixture Card. Please let us know if you’d like a hard copy and we will put one in the post, they can also be picked up from the winter clubhouse or click here to download a pdf. We are very much looking forward to another busy arena season and you can expect all the usual tournaments and events, as well as some new additions. Our Fireside Polo (Arena Open Evening) will be on Saturday 3rd November this year, a definite date for the diaries. We will be running at least two 8 goal tournaments, one in early December and one at the end of January. The Autumn and Winter Leagues will be back as well as regular club matches and thrice weekly chukkas. We have some livery spaces available this season for both full and for schooling livery. Eden is here so please get in touch if you would like some help with any specific issues or perhaps you just feel your horse would benefit from some extra schooling. As usual we are offering a membership discount for early joiners. If you join and pay before first chukkas on Thursday 18th October you will receive a 10% discount on any membership. A reminder that those of you who were full HPA members in the summer do not have any further HPA to pay but just ned to update your club for the winter. If you feel that you need a little reminder before returning to the arena consider joining our Refresher Course on Saturday 13th October from 2:00pm – 6:00pm. This will include some stick and ball, team drills, riding, arena tactics and rules and an Instructional Chukka. The cost is £200 per person, limited spaces available so please book early. Instructional Chukkas will continue all the way through at 4:00pm every Saturday (with the exception of 13th). Accommodation is now available in the main house at Druids, you can book in for Bed and Breakfast and as much polo as you can take, right on the doorstep. For more information on this please email me. 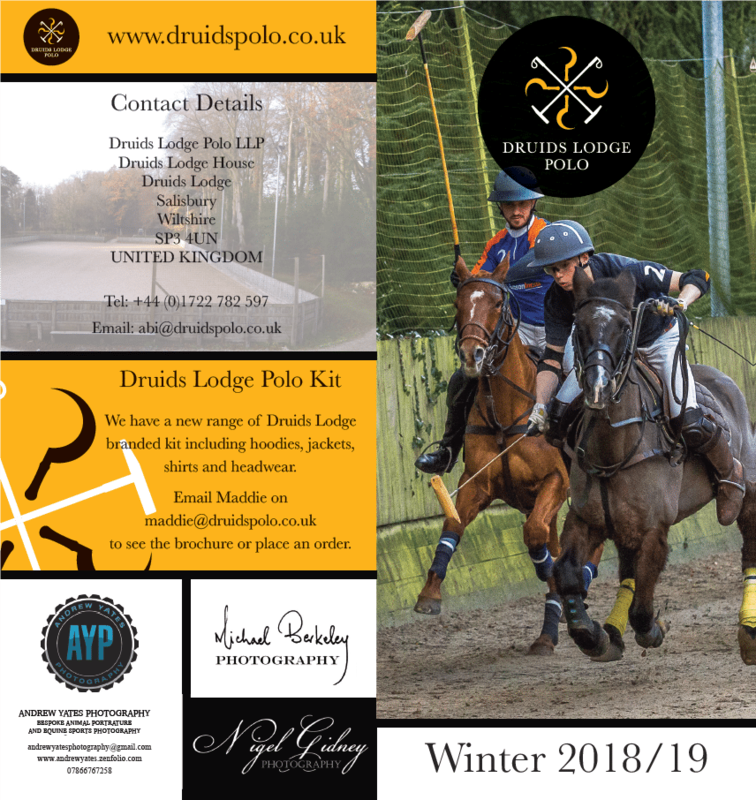 We have a new range of Druids Polo branded kit and will send a kit brochure out separately. Very much looking forward to seeing you all, please get in touch if you have any questions at all.